KOLKATA: Former Union Minister Yashwant Sinha on Saturday came down heavily on the Narendra Modi government saying that this was the first government after Independence which has been playing "mischief" with the developmental statistics. Addressing the opposition rally here, Sinha who quit the BJP recently said, under the present regime while praising the government was "desh bhakti"(patriotism), criticising it is "desh drohi" (sedition). "After Independence, this is the first government which has been presenting decorated and inflated developmental statistics to befool people," the former Union Finance minister in the Atal Bihari Vajpayee government said apparently referring to the Niti Aayog downgrading GDP growth rate during UPA time. 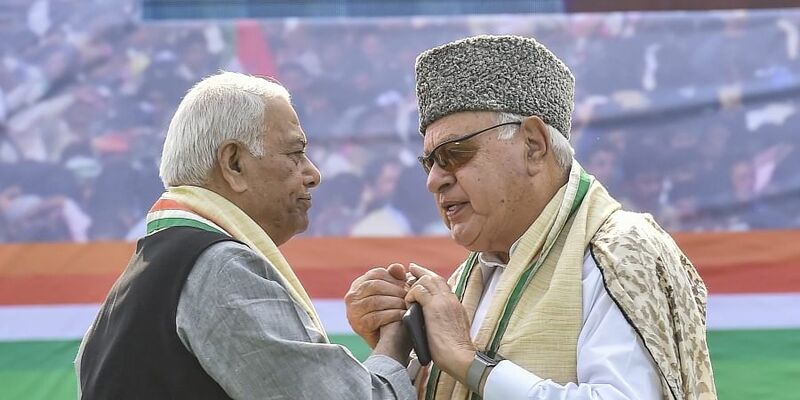 Sinha, who was in a committee to find a solution to the Kashmir problem said when he had suggested talking to the cross-section of people in the environment of love, he was branded a "Pakistani agent". From the dais itself, he urged NC leader Farooq Abdullah did he spoke wrong on this count, to which the NC leader nodded in negative. The former Union Minister made fun of Modi's government's slogan of "sabka saath sabka vikas" and said the apt slogan would be "sabka saath sabka vinash". He said now he is left with no personal desire but to see that this "anti-people" government is ousted from power.